Last week, as I drove home on Hwy. 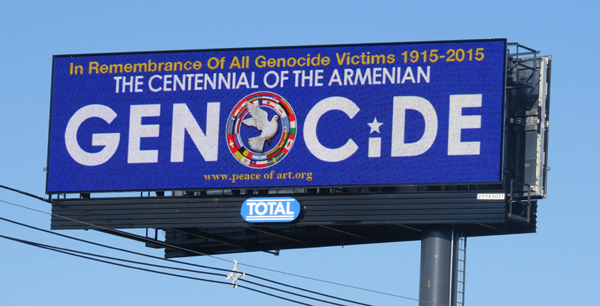 99, on the outskirts of a small central valley town, I saw a billboard similar to this one, marking the centennial of the 20th century’s first genocide. It is one of two dark centennials we will mark next week. Ones that no one wants to think of, but which we ignore at our own peril. The Ottoman Empire had been in decline well before the start of the first world war. Their initial military efforts were disastrous. Six months after the start of fighting , they had lost the Balkans, and ruin threatened. Well before the start of fighting, nationalist Turks and some religious extremists declared that to be saved, the Empire must purge itself of non-Muslim elements. By early 1915, as the government feared that Armenian Christians might seek a separate peace with Russia, it became policy. On April 24, 1915, notable Armenians in Istanbul were rounded up, a move that historians agree was the first step in a wider plan of annihilation. One and a half million Armenians would die in 1915 and 1916, and the killing would not stop completely until 1922. Though headlines around the world reported the atrocities at the time, Turkey denies responsibility to this day. No one would ever be punished, a fact not lost on a young German corporal named Adolf Hitler, who paid attention to world events. After the war, victorious nations, including the United States, found it more advantageous to seek trade agreements with oil producing nations than to seek redress for a scattered and decimated populace. The U.S. House of Representatives came close to a resolution condemning the killings as genocide in both 2007 and 2009, but Presidents Bush and Obama respectively, fended off passage of the bill, which they feared would upset our alliance with Turkey. Denial is still the order of the day for nation states with strategic interests, but as individuals, we fortunately still have the option of recognizing the truth. The other sad centennial we will mark next week is the first use of poison gas on the western front, on the evening of April 22, 1915, a day we now celebrate as Earth Day. Seeking a tactical advantage at the second battle of Ypres, the Germans launched a two day artillery barrage. When the guns fell silent, instead of the infantry charge that usually followed such a volley, the British soldiers saw a white cloud moving toward their trenches. One hundred and sixty-eight tons of chlorine gas wafted on the western breeze. Only when it struck did the soldiers experience the horror that hid in the cloud. Chlorine renders the lungs incapable of absorbing oxygen; the victim drowns in his own bodily fluids. Those who could ran for their lives. The gas opened up a four mile hole in the British lines, the kind of breakthrough the warring armies always sought, but as usually happened, confusion and inept command kept the German army from exploiting their advantage, which was soon neutralized. A British soldier with a background in chemistry, saw that the gas had turned brass buttons green. Realizing it was chlorine, he supplied the troops with an instant antidote – breathing through a urine-soaked cloth would neutralize the effects. Both sides rushed gas masks to the front, and any strategic advantage was lost. Most casualties in “The Great War” came from artillery, but poison gas somehow haunts our imagination as we think of the conflict that opened the 20th century. Nations entered the war with 19th century illusions of bravery and heroism. Such conceits were swept away in the first few months of mechanized carnage. For me, Earth Day, 2015 is a time to consider the warring impulses which live within the human heart. Every thought and every action of each individual matters. What can I do, now, on Earth Day, and every day, to aim in the direction of the world I would like to live in, rather then one where mass horrors on the evening news no longer cause us to raise an eyebrow? Armenian Genocide of 1915: An Overview, New York Times. A Century After Genocide, Turkey’s Denial Only Deepens,” by Tim Arango, The New York Times. This entry was posted in Article, History and tagged Armenian Genocide, Events, history, News, poison gas, World War I. Bookmark the permalink. Great reminders to all of us here, Morgan, and a good deal to ponder. Thanks for a thoughtful post. Thank you. For whatever reason, this has always been a fascinating subject for me.